TradePlateMate’s general terms and conditions (“General Terms”) of business are set out below. The accompanying Order Form may vary these General Terms. If there is any conflict or inconsistency between the Order Form and these General Terms, these General Terms will prevail. The Order Form and these General Terms will together form the contract between us and you. In this Agreement, any reference to “TradePlateMate”, “our” or “us” is to M3 Partners Limited, and any reference to the “Customer” or “you” is to any business or organisation who wishes to purchase our Products. All other terms are defined in these General Terms. When you have read, and understood the Order Form and these General Terms, you will communicate your acceptance of them to us, as described in the Order Form and sign this accordingly. We only sell to the Trade / Businesses and by signing, you accept that you are ordering as a business and not as a consumer. Agreement means collectively these General Terms and the Order Form. strong>Agreement Price means the price payable (excluding VAT) to TradePlateMate by the Customer for the Products, which will be identified in the Order Form. Business Day means any day other than a Saturday, Sunday or public holiday in the United Kingdom. Commencement Date means the date this Agreement comes into existence, when the Customer communicates its acceptance of this Agreement. Confidential Information means the information defined in Clause 9 (Confidentiality). Delivery Date means the date on which the Products are to be delivered as stipulated and accepted by you. Force Majeure means an event that is not within the control of the Party claiming force majeure relief, and which, by the exercise of reasonable care, such Party is not able to prevent and/or overcome. The Force Majeure causes include, but are not limited to, power failure, internet service provider failure, flood, fire, acts of terrorism or industrial action. General Terms mean these General Terms which are applicable to this Agreement. Intellectual Property Rights means any and all patents, rights in inventions, rights in designs, trademarks, trade and business names and all associated goodwill, rights to sue for passing off or for unfair competition, copyright, moral rights and related rights, rights in databases, topography rights, domain names, rights in information (including know-how and trade secrets) and all other similar or equivalent rights (subsisting now or in the future) in any part of the world, in each case whether registered or unregistered and including all applications for, and renewals or extensions of, such rights for their full term. Order means the Customer’s order for the Products, as set out in the Order Form. Order Form means the completed order form by you, whether online or in paper format, which identifies the Products that you will be purchasing from us. Products means any products sold by us which we have agreed to sell to you under this Agreement. h) nothing in the content will be interpreted against a Party solely because that Party was responsible for the preparation of the content. 2.1 TradePlateMate will sell and the Customer will agree to buy the Products in accordance with these General Terms and the Order Form. 2.2 This Agreement and the terms therein shall apply to the exclusion of any other terms that the Customer seeks to impose or incorporate, or which are implied by trade, custom, practice or course of dealing. 2.3 The Order constitutes an offer by the Customer to purchase the Products in accordance with these General Terms. The Customer is responsible for ensuring that the terms of the Order are complete and accurate. 2.4 The Order shall only be deemed to be accepted when we formally accept the Order which we shall confirm to you in writing, and you will be required to sign the Order Form incorporating these General Terms, at which point a contract shall come into existence. 2.5 TradePlateMate shall require the Customer to complete the Order Form and these General Terms whether in paper form or electronically. 2.6 TradePlateMate may accept subsequent Orders from the Customer by email but this shall be at TradePlateMate’s discretion and the Customer agrees and acknowledges that any subsequent Orders will be subject to these General Terms and upon acceptance of these General Terms, the Customer will be bound by these General Terms in this Order and any future Orders. 2.7 This Agreement is not evidence of, and does not create, an exclusive relationship between TradePlateMate and the Customer. 3.1 The Customer shall pay the Price as set out in the Order Form. 3.2 All invoices must be paid by the Customer. For any first Order placed with TradePlateMate, the Customer shall pay the invoice at the time of placing the Order. Any subsequent orders may be placed by the Customer and a credit account can be established at our discretion. Any future invoices must be paid by the Customer within 30 days without any deduction or offset. 3.3 The Prices exclude: 1) VAT, which will be additionally charged to the Customer in accordance with applicable indirect transactional tax legislation; and 2) the costs and charges of packaging, insurance and transport of the Products, which shall be invoiced to the Customer. c) will reserve the right to charge the Customer any reasonable costs incurred by TradePlateMate to recover any outstanding amounts from the Customer. 3.6 Time of payment will be of the essence in this Agreement. 4.1 TradePlateMate shall ensure that each delivery of the Products is accompanied by a delivery note that shows the date of the Order, the order number, the type and quantity of the Products and, if the Products are being delivered in instalments, the outstanding balance of Products remaining to be delivered. 4.2 Delivery dates, which may be shown on the Order, once confirmed, or in any other message emanating from TradePlateMate, whether oral or written, are only estimates. This means that TradePlateMate shall use all reasonable endeavours to affect delivery by the date and time agreed by the Parties but failing this the Customer shall have no recourse against TradePlateMate in case of delay in delivery. TradePlateMate shall not be liable for any delay in delivery of the Products that is caused by a Force Majeure Event or the Customer’s failure to provide TradePlateMate with adequate delivery instructions or any other instructions that are relevant to the supply of the Products. 4.3 TradePlateMate shall deliver the Products to the location set out in the Order Form or such other location as the Parties may agree (Delivery Location) at any time after TradePlateMate notifies the Customer that the Products are ready, but no later than the Business Day prior to despatch. 4.4 Delivery is completed on the completion of unloading of the Products at the Delivery Location. 4.5 TradePlateMate shall have no liability for any failure to deliver the Products to the extent that such failure is caused by a Force Majeure Event or the Customer’s failure to provide TradePlateMate with adequate delivery instructions or any other instructions that are relevant to the supply of the Products. 4.6 TradePlateMate shall endeavour to deliver the Order in its entirety, but reserves the right to part deliver, upon notification to the Customer. 5.1 The Customer shall receive a manufacturer’s warranty upon delivery of the Products as long as the Customer shall use the Products in accordance with the instructions, and guidance. This warranty does not cover either the painted or aesthetic finishes on the Products. 5.2 The Customer shall comply with all instructions on the installation of the Product and shall not do anything which would render the warranty null and void. 5.3 Instructions and Guidance for using the Products are supplied with all deliveries and the Customer shall be responsible for ensuring communication of the same to all person or persons who will use the Products. 5.9 Except as provided in this clause 5, TradePlateMate shall have no liability to the Customer in respect of the Product’s failure to comply with the warranty set out in clause 5.1. 6.1 The risk in the Products shall pass to the Customer on completion of delivery. 6.2 Title to the Products shall not pass to the Customer until TradePlateMate receives payment in full (in cash or cleared funds) for the Products, in which case title to the Products shall pass at the time of payment of all such sums. 6.6 give TradePlateMate such information relating to the Products as TradePlateMate may require from time to time. 7.1 To the fullest extent permitted by law, all warranties, conditions, representations and other terms implied by statute or common law are excluded from this Agreement. 7.2 Nothing in this Agreement will limit or exclude the liability of TradePlateMate for: (i) death or personal injury caused by TradePlateMate’s negligence; (ii) fraud or fraudulent misrepresentation by TradePlateMate; (iii) breach of the terms implied by section 12 of the Sale of Goods Act 1979; or (iv) any other liability of TradePlateMate that cannot be limited or excluded by law. 7.3 TradePlateMate will not be liable to the Customer for any wasted or lost management time, loss of profits, loss of business, loss of goods, loss of use, loss of revenue or for any indirect, special or consequential losses or damages that the Customer suffers, sustains or incurs (including as a result of an action brought by a third party) in connection with the Products or otherwise, regardless of whether or not such losses or damages were reasonably foreseeable or actually foreseen by the Parties. a) TradePlateMate’s maximum aggregate liability to the Customer for losses or damages that the Customer suffers, sustains or incurs in connection with the Products or otherwise (whether in contract, tort (including negligence), statute or otherwise), will be limited to and will not exceed the value of the Order. 7.5 The Customer acknowledges and agrees that the terms of this Clause 7 are reasonable and fair. 8.3 Each Party may disclose to the other Party information in respect of its business, processes, operations, customers and suppliers, finances, products, technology and know-how together with other information that is not in the public domain or generally known by other persons including the existence and terms of this Agreement. For the purposes of this Agreement, all such information will be treated as “Confidential Information”. 8.2 Each Party agrees to hold in confidence all Confidential Information of the other Party and not to disclose, or cause it to be disclosed, to any person other than its personnel and professional advisors. 8.3 Each Party agrees not to make use of the Confidential Information of the other Party (including by duplicating or distributing it), except as is necessary for the performance, supply, use and enjoyment of the Services and for the administration of this Agreement. 8.4 Clauses 8.2 and 8.3 do not apply to: (i) information that becomes or is in the public domain (other than due to a breach of these terms); (ii) information that is already known to a Party (where that Party can reasonably prove and demonstrate it); (iii) information that must be disclosed due to legal, regulatory or governmental requirements, rules or orders; and (iv) information that the Parties have agreed in writing may be disclosed. 8.5 The Parties may use and retain the Confidential Information for their own internal business processes and purposes, which will include the retention of Confidential Information in electronic and computer records, files and devices. 8.6 TradePlateMate may reference the Customer’s name in its marketing materials but if so, it shall seek permission from the Customer in advance. 8.7 The obligations of confidentiality set out in this Clause 8 will survive any termination of this Agreement for a period of three (3) years. 9.1 TradePlateMate will at all times retain the ownership of any and all Intellectual Property Rights existing in the Products. 9.2 The Customer must not copy, duplicate, decompile, reproduce, modify, or create derivative works from or otherwise modify the Products in any way. d) the Customer’s financial position deteriorates to such an extent that in TradePlateMate’s opinion the Customer’s capability to adequately fulfil its obligations under the Agreement has been placed in jeopardy. 10.2 Without limiting its other rights or remedies, TradePlateMate may suspend provision of the Products under this Agreement or any other contract between the Customer and TradePlateMate if the Customer becomes subject to any of the events listed in clause 10.1, or TradePlateMate reasonably believes that the Customer is about to become subject to any of them, or if the Customer fails to pay any amount due under this Agreement on the due date for payment. 10.3 Termination of this Agreement for any reason will not affect any rights, duties or liabilities of either Party accrued prior to the termination. 10.4 Without limiting its other rights or remedies, TradePlateMate may terminate the Agreement with immediate effect by giving written notice to the Customer if the Customer fails to pay any amount due on the due date for payment. 10.5 On termination of the Agreement for any reason the Customer shall immediately pay to TradePlateMate all of the outstanding unpaid invoices and interest. 10.6 Any provision of the Agreement that expressly or by implication is intended to come into or continue in force on or after termination shall remain in full force and effect. 11.1 Neither Party will be liable for any delay or failure to perform any of its obligations under this Agreement (other than an obligation to pay money) if, as soon as possible after the beginning of the Force Majeure affecting its ability to perform any of its obligations under this Agreement, it gives a notice to the other Party that complies with this Clause 11.1. 11.2 The notice required under Clause 11.1 must include a description of the Force Majeure and where possible, an estimate of the time during which the Force Majeure will continue. The Party that is prevented from carrying out its obligations as a result of Force Majeure will resume performance of its obligations as soon as reasonably possible. 11.3 If the Force Majeure continues for more than 90 days after the date of the notice required under Clause 11.1, either Party may terminate this Agreement by giving the other Party not less than 30 days’ written notice. Neither Party will be liable for any losses or damages which arise from or are associated with termination of this Agreement because of Force Majeure. 12.1 If you have any complaints or issues regarding the Products, please contact TradePlateMate directly. 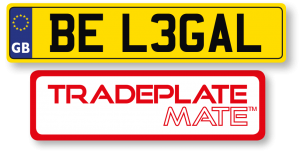 Any refunds (if applicable) will be treated on a case by case basis and at TradePlateMate’s discretion. 12.3 The Customer is responsible for adequately packaging any returns and for arranging and paying for the carriage. 13.1 This Agreement and any disputes, actions, claims and all non-contractual obligations arising from it will be governed by and construed in accordance with the laws of England and Wales. 13.2 If there is a dispute between the Parties in respect of this Agreement, in the first instance, the Parties will attempt to manage and resolve the dispute through reasonable discussion with each Party bearing its own costs. If the dispute is not managed or resolved within 30 days of its original notification, Clause 13.3 will apply. 13.3 Subject to Clause 13.2, the Parties agree that the courts of England and Wales will have exclusive jurisdiction to settle any disputes, actions or claims under or in respect of this Agreement. 14.1 Notices: All notices must be in writing (including by email) and must be sent for each Party. A notice by email will only be deemed received when it is expressly acknowledged by the recipient, which excludes any automatic system receipt or response. 14.2 Rights of Third Parties: A person who is not a Party to this Agreement will not have any rights under the Contracts (Rights of Third Parties) Act 1999. 14.3 Assignment: TradePlateMate may at any time assign, transfer, mortgage, charge, subcontract or deal in any other manner with all or any of its rights or obligations under the Agreement. The Customer may not assign this Agreement to any other person or a third party without the prior written consent of TradePlateMate. 14.4 Amendment: No amendment to this Agreement will be valid or binding unless and until it is agreed in writing (including by email) by both Parties. 14.5 Waiver and Severability: A failure to exercise, or a delay in exercising any right, power or remedy by a Party will not operate as a waiver. If any provision of this Agreement is held to be invalid or unenforceable, such provision will be severed and the remaining provisions will remain valid and enforceable. 14.6 Entire Agreement: This Agreement comprises the entire agreement between the Parties and supersedes all prior negotiations, understandings and communications between the Parties. 14.7 Severance: If any provision or part-provision of the Agreement is or becomes invalid, illegal or unenforceable, it shall be deemed modified to the minimum extent necessary to make it valid, legal and enforceable. If such modification is not possible, the relevant provision or part-provision shall be deemed deleted. Any modification to or deletion of a provision or part-provision under this clause shall not affect the validity and enforceability of the rest of the Agreement.